October 5, 2018 – With fall in full swing here in the Northwest, I can tell you a lot of folks (including me!) are starting to feel the chill in the air. This is the season that makes me most grateful for my Finnleo Infrared Sauna. I love popping into it each morning not only for the health benefits but also to warm my body through and through for the day. One of the hidden therapy benefits many overlook when hunting for a sauna: chromotherapy. Many will dismiss light therapy as “voodoo” while others enthusiastically use it. Chromotherapy (like other holistic approaches to medicine like acupuncture) dates back thousands of years. There’s proof that as far back as 2,500 years ago colored light was used to aid in healing in China, India and Egypt. One of the most fascinating things I came across regarding light therapy for healing originated with Pythagoras. He ordered various halls to be built with glass and lenses designed to break up sunlight into the colors of the spectrum. Each “color hall” was used to address a specific ailment. Research done over the last 50+ years seems to support exposure to various colors having a positive assist for overall health. It’s long been determined that light therapy is excellent for those suffering from SAD (Seasonal Affective Disorder). I can tell you bathing in the light in my sauna daily has certainly improved my positivity! Red—This is known as an energy color, as well as one that improves circulation and promotes red blood cell production. Red light therapy has also been used to help patients in a paralytic state with recovery! With it’s circulatory benefit, it stands to reason it could also help out with Restless Leg Syndrome. Blue—Blue (and violet) help eliminate toxins. This is a “boost” to the toxin flush you’ll already enjoy from a sauna session. Blue light therapy has also been used to help with sciatica. Green—Known for antibacterial benefits, as well as assisting your body’s ecosystem achieve balance. Yellow—This hue is touted for its antioxidant properties and can help boost immunity. It can aid with digestive issues and your lymphatic system. Fall is a terrific time to think about investing in an infrared sauna. Why not drop by one of our showrooms today and take a look (and a sit!) 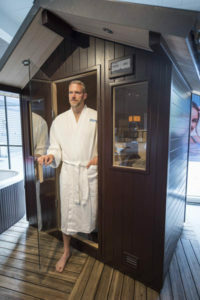 in a Finnleo Infrared Sauna. Take in the light as well as the heat, and feel your body say, “Aaaaahhhh!” You’ll never look back!